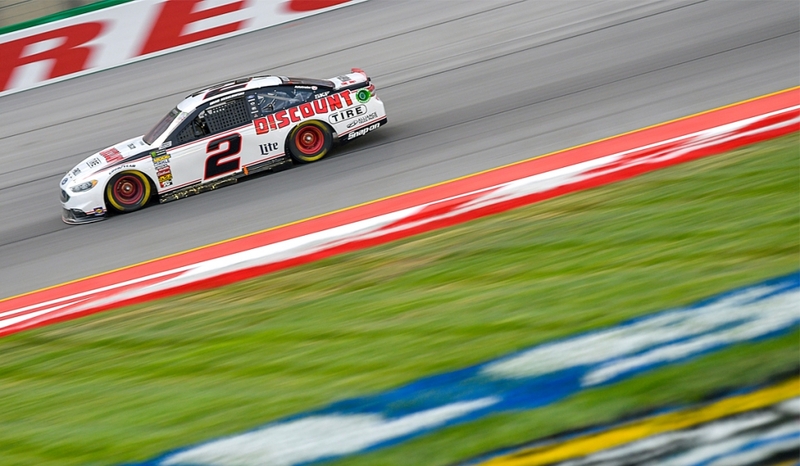 Brad Keselowski endured an up-and-down race in Saturday night’s Quaker State 400 at Kentucky Speedway, but he and the team persevered to score a third-place finish, their fifth top-five finish of the year. After starting the race from the fourth position, Keselowski maneuvered his way into the second position before the team’s first pit stop of the day at lap 39. A solid stop by the Discount Tire pit crew seemed to have put their driver back on track in the same position, but Keselowski was penalized on his pit road exit. The resulting pass-through penalty dropped Keselowski to 19th in the running order and he would only race his way to 18th before the end of the first, 80-lap stage. The second, 80-lap stage began with Keselowski in the 18th position, but after tire pressure adjustments by crew chief Paul Wolfe his car came to life and he was able to move up near the top 10 before another pit stop on lap 111. Several teams elected to take only two tires during this pit cycle while the No. 2 crew changed all four for Keselowski. He would return to the track in the 15th position where he would finish the second stage. The pit stop between the second and final stages allowed Wolfe to call for a two-tire stop as Keselowski noted that he needed to find a way to pick up some track position. As a result of this call, the three-time race winner restarted from the lead for the 107-lap stage. Keselowski would hold the top spot until lap 207 before being passed by eventual race winner Martin Truex, Jr. Just after relinquishing the top spot, the final caution of the day came out to give the No. 2 team a final pit stop opportunity. Keselowski would restart sixth after the pit stop, but would work his way into third place before taking the checkered flag.